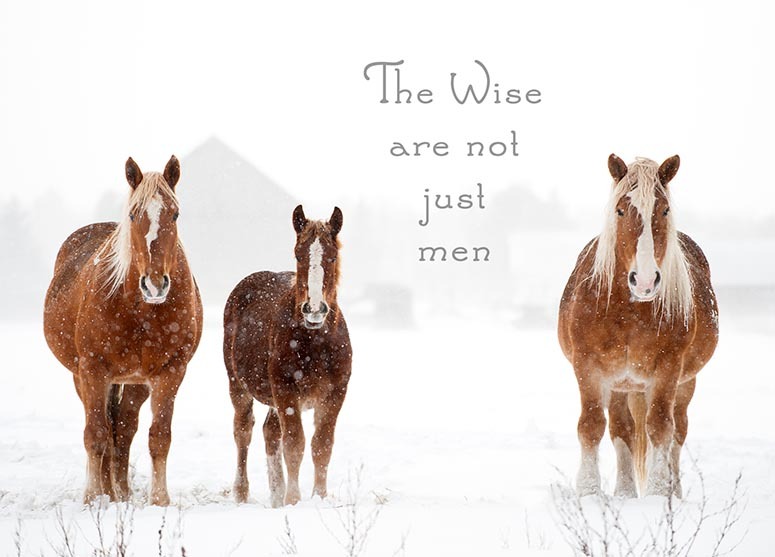 Front: The Wise are not just men. Inside: "There is no time more fitting than the holidays to pause and reflect gratefully upon the folks and the creatures who make our lives meaningful"
Photo is by Christina Handley - an award winning equestrian photographer who lives in Canada. With a career spanning over 18 years, her images have appeared in many well known equine and farm publications. Christina and her husband Boyd live on a working farm in southern Ontario, and her photos reflect real life in agriculture and with horses. They own draft horses, beef cattle and a myriad of other farm animals, housed on lovely picturesque acres that include traditional farm outbuildings; we frequently see them all immortalized via her camera. Her appreciation and reverence for the rural lifestyle is apparent in the sensitivity of her images, and this one is no exception. The wise ones shown are 14 year old Kelly, 9 month old Harry and 18 year old Rachel - members of Christina and Boyd's Belgian herd. This photo was taken in 2009 and sadly Kelly and Rachel are gone now. Harry has grown up to be a strapping big boy and is a standout in harness with his deep chestnut color. He's taken on his two foster mom's share of wisdom, and the Handleys are bringing him along in his training as a productive member of the farm's "staff".